At Baumatic, we know that there’s never a convenient time for your fridge freezer breakdown. That’s why our nationwide team of expert Baumatic engineers is here to ensure you can get an appliance repair appointment within as little as two working days. With Baumatic’s appliance repair service, you can save the expense of having to buy a new appliance and get your fridge freezer back up and running before you’ve had time to miss it. Is your machine in guarantee or do you have an extended warranty? Whether your appliance in less than 12 months old, or you already enjoy peace of mind with an extended warranty, all you need to do is call us! Need a repair but not covered by a guarantee or a warranty? 08442 579 199 to talk to us about our great value Fixed Price Repairs and Repair and Care solutions. Opening hours: Mon-Fri 8am-5:30pm, Sat 9am-4:30pm, Sun 10am-4pm. Have you tried our Advice Centre? Many commonly reported problems are easily fixed and without the need of an engineer! 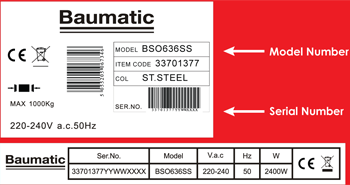 Transparent and fair pricing policy – With Baumatic there are no hidden extras, so you know exactly what you're paying for and how much it will be. Expert engineers – Nobody knows Baumatic products better than our Hoover engineers. Hoover engineers only fix Hoover appliances and are experienced professionals, so you can have full peace of mind that they will correctly diagnose and repair the fault. A name you can trust – Baumatic is a household name with a reputation that's been built over generations. Our engineers are honest, trustworthy and reliable, and deliver the high standard of service you would expect from Hoover. Nationwide coverage – Regardless of where you live in the UK, we will send an engineer to your home to do the appliance repair on a day that suits you. All repairs guaranteed – Every appliance repair by Baumatic is guaranteed for up to 12 months. If the fault reoccurs during this time, we will come out and repair it again at no extra charge. Prompt and reliable service – Hoover Candy Baumatic Group engineers aim to complete every appliance repair at your home within just 30-60 minutes, so you can get back to your usual routine as quickly as possible.